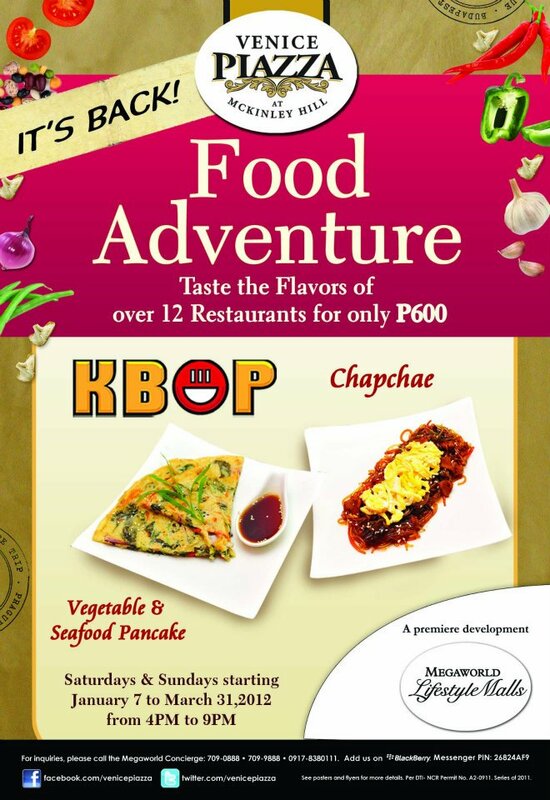 The Food Adventure returns to offer more of the sumptuous dishes from Fort Bonifacio's gourmet oasis. A taste of the abundant life with seafood, meat, pasta, vegan food, and sweet indulgence will welcome you, all in a day or two, just for that very special weekend. Following the success of last year’s Food Adventure, Venice Piazza is bringing back everyone’s favorite culinary journey, that’s includes moi. But they have made it even better by adding two more restaurants to the previous 12 dining establishments. The promo is already ongoing since January 7 and will end on March 31, 2012. Open every Saturday and Sunday from 4 PM to 9PM. The menu is still complete from appetizers, to the main course, down to sweet ending of desserts, coffees and teas. It still comes with a passport, but wristbands were added, making it stricter. look for the page which shows an organized list of the samplers according to food categories, such as appetizer, main course, dessert and beverage, so it's easier where to go next or what to get. The passport serves as guideto the amazing dishes prepared by the 14 participating restaurants. Restaurants may offer two dishes, which give you the option to choose which you would prefer. A weekend definitely worth having as you enjoy international cuisiine, from American, Japanese and of course Asian. It was such a blessing to be invited to the press launch, thanks to the Marketing Officers of Megaworld and to a fellow blogger, Ms. Jinkee Umali of Live Your Life to the Fullest. I had the delicious chocolatey concoction, Moroccan Mint, to begin with the whole gastronomic adventure. d. Figaro's Iced Tea or Iced Coffee. Why haven't I tried this? This is what food-tripping is all about. 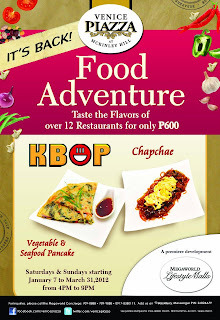 All of 14 of these joints will sample their best for only P600 for every Food Adventure Passport. Here is something you might want to take note of, the passport is not allowed for sharing, but you can go back on the next day if you haven't tried all the dishes available. Apart from the great food, the passport holders can also enjoy special discounts and freebies any day of the week. Free Iced teas are up for grabs at Pinchos for every P300 purchase. Blackwood Bistro will also give out a free dessert, just purchase anything for P500. So buy your passport now and enjoy a food trip like no other only at Venice Piazza at McKinley Hill in Fort Bonifacio, as you travel with your taste buds at the glorious bite of Italian-inspired mall. For more information, call the Megaworld Lifestyle malls concierge at 7099888 or 09178380111. Like their Facebook page for more updates. also love the theme/design), I don't have time to read through it all at the minute but I have bookmarked it and also added in your RSS feeds, so when I have time I will be back to read a lot more, Please do keep up the excellent job. Superb, what a website it is! This webpage gives valuable information to us, keep it up.